Can Dry Skin Cause Itchy Bumps? Having one or two little dry spots on your skin may be not a big problem. But what if you also spot itchy bumps? Can dry skin cause itchy bumps? Is it a bad sign of a fatal disease? You shouldn’t be worry if you find yourself in this condition. It all has a cure once you know the cause. But not all of skin problems include itchy bumps on the symptom. But there are several skin condition which cause dry skin with tiny red itchy bumps. Eczema is one of the answer to the question can dry skin cause itchy bumps. It’s also called atopic dermatitis. It usually begin in early childhood and gets chronic over year if it’s untreated. Eczema is known to be inherited from family members who have asthma and hay fever. But it’s not a classical allergic disease. It’s caused by the lack of skin protein, the skin gets dry, itchy, bumped, and thickened. Usually around the hands, neck, face or leg. If you find the early symptom, see your doctor right away. Psoriasis is the condition where your skin cells grow faster than normal. It happens if you have an immune system that think your healthy skin cells as a threat and attack them. 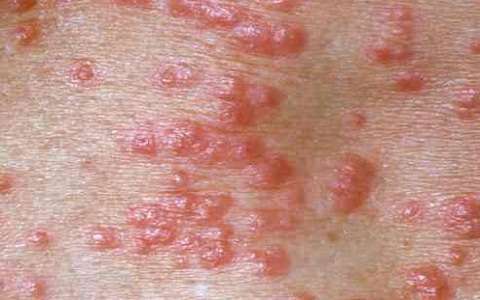 It develop complications like patches of red and bumps, dry and itchy skin. The occurrence of psoriasis is a sign of chronic condition of skin. It can occurs on the scalp, nails and joints. This is why psoriasis become the answer to can dry skin cause itchy bumps. See dermatologist for further treatments. Somewhere between the ages of 40 to 58, most women enter menopause, the time when ovaries stop releasing end, the production of estrogen begin to decline. Estrogen does many good things to women’s body, one of them is stimulating the formation of skin-smoothing collagen and oils. As a result, the skin begin to dry, itchy and bumped in some serious cases. To keep your skin moist and healthy, do a healthy diet, eat foods with omega 3 like salmon, walnuts, fortified eggs or algae oils. And also use a broad spectrum of sunblock. As many as a third of people with diabetes will have a skin condition at some point in their lifetime. One of them is dry skin followed by itching and bumps. It’s a result of high blood glucose. Your body will attempt to remove the excess glucose by increasing urination. For a diabetes patient, scratching is a total no, because if it peels of or leaving scar, it won’t be good to you.